Nothing can quite prepare you for life with a new baby. Pregnancy is so all consuming and the biggest worry is about how seven pounds of baby is going to actually fit out of your body. The actually reality of having a baby can be more exciting, intense, exhausting and exhilarating than you ever imagined. Some people choose to use cloth nappies from birth whilst others wait a few days or weeks until they are settled into a little more of a routine before ditching the disposables. If you do decide to use real nappies from the very first one then we are here to let you know not only is it possible, but it isn’t as hard as you may think. Hospitals, birth centres and midwives have all seen them before and will all respect your wishes. You can even add something in to your birth plan to make it clear this is what you want if you are worried about the intensity of labour. Make sure you are prepared with wet bags, plenty of nappies and liners and you are good to go! 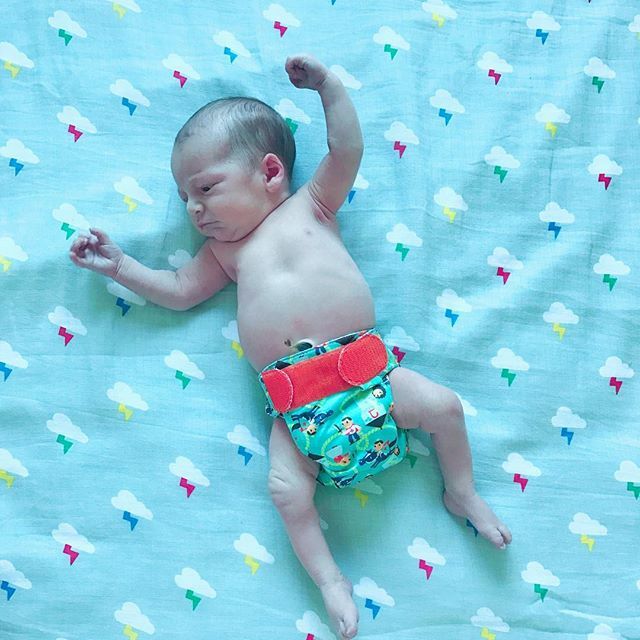 There is nothing cuter than a brand new baby in their first nappy. The number of nappies in your stash will affect how often they need a wash. Our Teenyfits are ideal for a newborn but many people also use our Easyfit Birth-to-Potty nappies from birth too. Whilst line drying is ideal, they can be tumble dried too to save time. The washing process is pretty easy and doesn’t require much effort, encouraging your partner to help out is a great idea too and takes some of the strain off. Our Teenyfit nappies are designed to be slim fitting and absorbent for newborns which means that they should fit fine underneath baby’s clothes without needing to change size. Newborns need to be changed around every 2 hours regardless of which type of nappy you use and we recommend a liner to help keep their little bots dry – either a disposable one or a fleece. Even the stickiest meconium washes out of nappies and liners without leaving a mark, just make sure you do a cool rinse before the proper wash.
And really, that is all there is to it! Our Teenys are dad friendly, quick drying and slim fitting and you can keep baby away from harsh chemicals for longer. World Book Day PeeNut Giveaway!